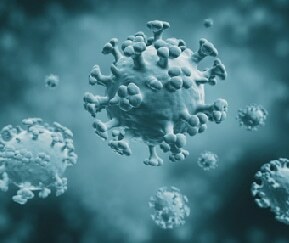 Viruses are complexes consisting of protein and an RNA or DNA genome. They lack both cellular structure and independent metabolic processes. They replicate solely by exploiting living cells based on the information in the viral genome. 1. A genome of DNA or RNA, double-stranded or single-stranded, linear or circular, and in some cases segmented. A single-stranded nucleic acid can have plus or minus polarity. 2. The capsid, virus-coded proteins enclosing the nucleic acid of the virus and determining its antigenicity; the capsid can have a cubic (rotational), helical or complex symmetry and is made up of subunits called capsomers. 3. In some cases an envelope that surrounds the capsid and is always derived from cellular membranes. 4. Various enzymes. Viruses require a number of different enzymes depending on genome type and mode of infection. In several virus species enzymes are a component of the virus particle, for example the neuraminidase required for invasion and release of myxoviruses. Other examples include nucleic acid polymerases such as the RNA-dependent RNA polymerases in antisense viruses, the DNA polymerases in smallpox viruses and the RNA-dependent DNA polymerase in hepatitis B viruses and retroviruses. 5. Hemagglutinin. Some viruses (above all myxoviruses and paramyxoviruses) are capable of agglutinating various different human or animal erythrocytes. These viruses bear a certain surface protein (hemagglutinin) in their envelope that enables them to do this. The hemagglutination phenomenon can be made use of for quantitative viral testing or—in the hemagglutination inhibition test—for virus identification and antibody identification. In biological terms, hemagglutinin plays a decisive role in adsorption and penetration of the virus into the host cell. Figure 1. Viral structure (a) and replication (b). Viral disease is some harmful abnormality that results from viral infection of the host organism. 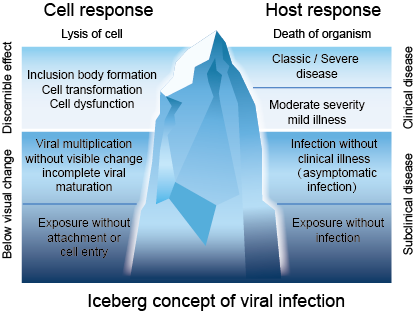 Important principles that pertain to viral disease include the following: (1) many viral infections are subclinical (Figure 2); (2) the same disease may be produced by a variety of viruses; (3) the same virus may produce a variety of diseases; (4) the disease produced bears no relationship to viral morphology; and (5) the outcome in any particular case is determined by both viral and host factors and is influenced by the genetics of each. Important features of two general categories of acute viral diseases (local, systemic) are compared in Table 1. To produce disease, viruses must enter a host, come in contact with susceptible cells, replicate, and produce cell injury. Specific steps involved in viral pathogenesis are the following: viral entry into the host, primary viral replication, viral spread, cellular injury, host immune response, viral clearance or establishment of persistent infection, and viral shedding. For host infection to occur, a virus must first attach to and enter cells of one of the body surfaces. Most viruses enter their hosts through the mucosa of the respiratory or gastrointestinal tract. Major exceptions are those viruses that are introduced directly into the bloodstream by needles (hepatitis B, human immunodeficiency virus [HIV]), by blood transfusions, or by insect vectors (arboviruses). Viruses usually replicate at the primary site of entry. Some, such as influenza viruses (respiratory infections) and noroviruses (gastrointestinal infections), produce disease at the portal of entry and likely have no necessity for further systemic spread. Many viruses produce disease at sites distant from their point of entry. Mechanisms of viral spread vary, but the most common route is via the bloodstream or lymphatics. The presence of virus in the blood is called viremia. Virions may be free in the plasma or associated with particular cell types. Some viruses even multiply within those cells. The viremic phase is short in many viral infections. Destruction of virus-infected cells in the target tissues and physiologic alterations produced in the host by the tissue injury are partly responsible for the development of disease.General symptoms associated with many viral infections, such as malaise and anorexia, may result from host response functions such as cytokine production. Clinical illness is an insensitive indicator of viral infection; inapparent infections by viruses are very common. The host either succumbs or recovers from viral infection. Recovery mechanisms include both innate and adaptive immune responses. Interferon (IFN) and other cytokines, humoral and cell-mediated immunity, and possibly other host defense factors are involved. The relative importance of each component differs with the virus and the disease. In acute infections, recovery is associated with viral clearance. However, there are times when the host remains persistently infected with the virus. The last stage in pathogenesis is the shedding of infectious virus into the environment. This is a necessary step to maintain a viral infection in populations of hosts. Shedding usually occurs from the body surfaces involved in viral entry. Shedding occurs at different stages of disease depending on the particular agent involved.